Let me start by saying I have no haunting tales from my own childhood Halloween experiences. It never spooked me. Seeing the scary costumes didn’t impact me one way or the other. Attending the haunted house set up in the sanctuary of my church might seem a bit strange now, but I thought nothing of it at the time. So when we had our daughter, my husband and I weighed the pros and cons of Halloween. As parents. Together, we decided we would not celebrate this holiday. A quick Internet search will enlighten you about the evening’s history. Actually, our research taught us that most holidays have a pagan beginning. Historically, the church would start their own holiday as a way of breaking away from many of the pagan celebratory acts. There are pagan holidays celebrated around Easter, Christmas and yes, Halloween. Further, some of these religious holidays are no longer celebrated by the church at large. All Saints Day, on November 1st, honors the lives of saints who have died before us. Some Catholics still participate in this day but by and large, Christians don’t know it exists. I know, T.M.I. But this shows you how seriously we took our decision. I knew a day would come when my daughter wanted to know why we didn’t participate in Halloween, and I wanted to be ready with an educated answer. Fast forward a few years. Most of our family thought we’d gone overboard on the Halloween boycott. We had friends who celebrated and those who didn’t. My sister-in-law casually invited us to a Fall Festival Party downtown on the weekend of Halloween. And a lot of justifying started happening. It wasn’t on the day of Halloween. It was downtown, very safe. We received candy at parades so what made this any different? My mother-in-law just happened to still have a clown costume my husband wore as a toddler. Nothing scary. Each year, I would dread Halloween as it approached because I knew my daughter was starting to put together the fact that there was a great big party she didn’t get an invitation to. Because her parents said no. Finally, it all came to a head her preschool year at a parochial school. She didn’t attend the school party. Then, the week of Halloween, a friend from back home posted an article on why Christians SHOULD celebrate Halloween. A perspective that changed my way of thinking. The article suggested that as believers, we do enough hiding out from the world. Perhaps the best way to be the salt and the light God called us to be is by joining in on the fun. The fun. Not the scary, dark side of Halloween. It encouraged readers to find ways to show God’s love in their Halloween activities. If you live in a subdivision, be the house where people go for a chili supper or a hayride after they trick or treat. Rather than a trunk-or-treat event at your church, hand out candy in the neighborhoods where you live. Use the night as an opportunity to shine for Jesus. This, this, I could chew on as a possibility. I called a girlfriend of mine and told her we might be thinking about joining her on Halloween…. And here’s what we’ve decided to do. We do the classroom party at school. 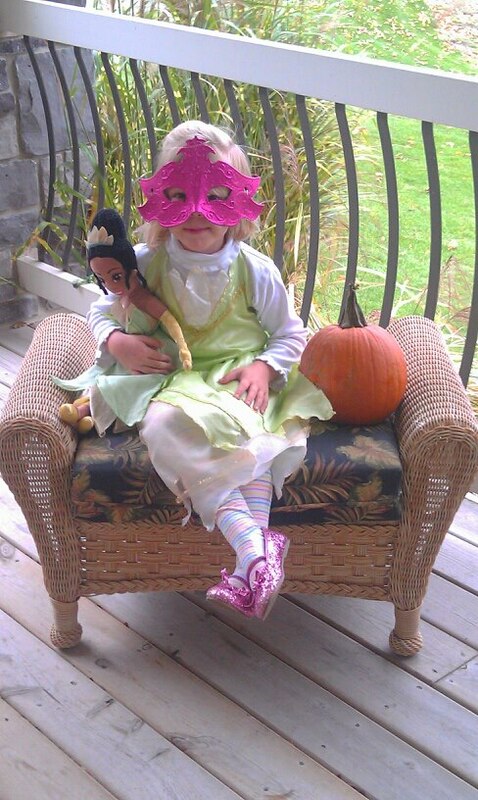 Our daughter dresses up in a non-scary costume (thus far we’ve gone from one princess to another princess to another). Halloween night, we head downtown where businesses hand out candy to kids before it gets dark. We print up an applicable Bible verse and she hands them out to each person who gives her a piece of candy. We end up at a local church who serves a hot dog dinner. Finally, we go to our friends’ house for chili and dessert. A very fun evening that makes my daughter very happy. Call it a compromise. Definitely a change in opinion from our early days of parenting. But one we are all satisfied with for now. In a way, I guess you could say we took Halloween back. It’s still not my favorite night of the year. We’ve made it a holiday in good standing with the beliefs we try to instill in our daughter. And every year, we stay on the lookout for ways to glorify God on this day too. Because after all, it was His day first. I’m here to encourage readers to trace God at work in their everyday faith. I write over at http://tracesoffaith.com . Contact me on Facebook: https://www.facebook.com/pages/Tracesoffaith/1378941072369883. Or on Twitter: https://twitter.com/tracesoffaith. Lutheran’s celebrate it too 🙂 Or at least we acknowledge the day. Didn’t know that! Super cool! I’m glad you’ve found a way to create a positive experience that works with your beliefs! It can be hard to find a way to connect with popular culture that’s authentic to who you are, no matter what your religion. I agree with this article one hundred percent!!! 🙂 Thank you for taking a look! We do Halloween, because I think it has great components to it. I think walking around within your neighborhood and getting to see the neighbors has a value to it. I make sure that my kids are well educated about God and our beliefs. The two have never been contrary to each other. If it becomes anything other than fun, and fellowship, then it will stop.